I’m really starting to appreciate artists and their efforts to uplifting natural beauty. 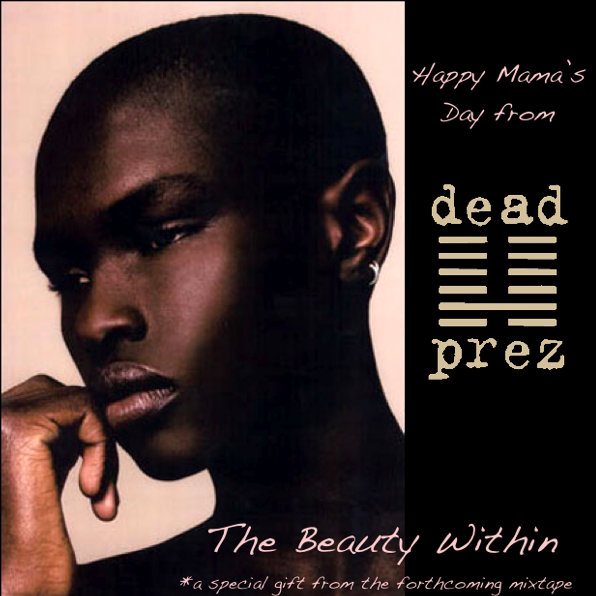 It’s not about hate or discrimination so when I see Dead Prez devoting a song on the essence of natural beauty it really shines a positive light. They released it around Mother’s Day last year but it can never get out when you are celebrating Mama Earth. (Earth Day, Mother’s Day, catch my drift?) The main stream media doesn’t always portray the “natural woman” in a positive aspect so it’s only right that I give spotlight to those that do. “The Beauty Within” is taken from the mixtape with DJ Drama “Revolutionary But Gangsta Grillz”. Artists Stic Man and M-1 or RBG explain the essence of naturaly beauty over B.O.B’s “Nothing on You” beat. What do you guys think? Dead Prez “The Beauty Within” from kinetikcinematix on Vimeo.